The 3,000-Watt iQ18B is a front loaded 18" powered subwoofer ideally suited for a wide range of portable and fixed installation, music and speech sound reinforcement applications. The high excursion 18" low frequency driver with double suspension low mass 4" voice coil provides fast and accurate transient response for virtually distortion-free operation – even in the most demanding performances. Equipped with a very efficient and lightweight KLARK TEKNIK Class-D power amplifier, the iQ18B provides an impressive 3,000 Watts of output power. A high degree of control over the loudspeaker system’s performance is managed by a sophisticated, but easy to use KLARK TEKNIK Digital Signal Processor (DSP), which provides dynamic EQ and transparent limiting for the utmost punch and definition at high output levels – and long-term reliability. iQ18B’s advanced DSP speaker modelling presets include detailed and accurate models of some of the audio industry’s most-respected speaker systems. On the rear panel amplifier module, you will find a fully featured user interface consisting of an LCD display, the Channel A/B gain control, and a single rotary encoder for intuitive access to level, EQ, Speaker modelling, and Feedback Control (FBI). In addition to the two combination balanced XLR/ jack inputs and balanced XLR outputs for powered satellite loudspeakers, the iQ18B features a mic/line switch and level control with signal present LED. 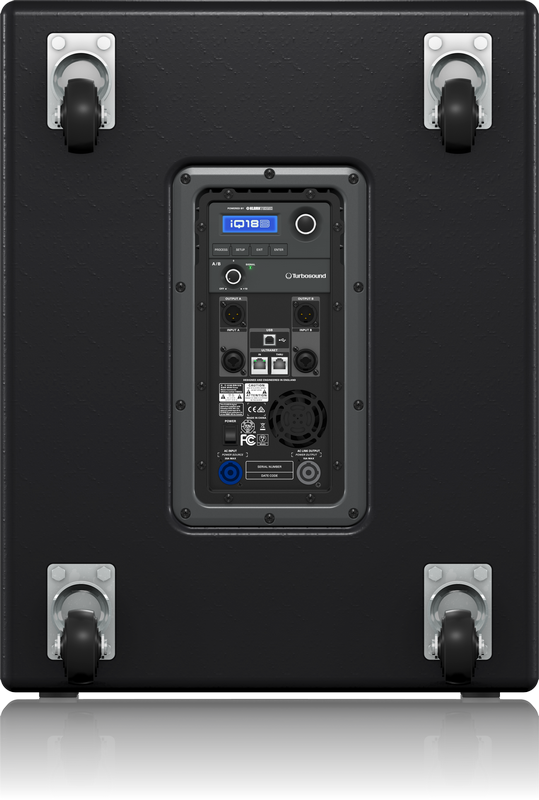 The iQ18B also features our proprietary ULTRANET technology, which allows the use of CAT5 cables for transmitting pristine multi-channel audio signals and other information between ULTRANET-enabled products, such as digital mixers, powered loudspeakers, and personal monitor systems. This digital distribution networking not only eliminates the potential for RFI and crosstalk so common to analogue methods, but also significantly reduces the setup or installation time required. An onboard USB port provides access for remote control of the iQ18B via PC computer, as well as DSP and speaker modelling firmware updates.